Do you or someone you know not like President Trump very much? In some cases, this dislike rises to the level of hatred and even violence. Jesus, despite being innocent and without sin, was hated so much He was murdered. Nevertheless, you may be surprised to learn that this post isn’t directly about Donald Trump. In fact, it’s about something more important. If you will be gutsy with me for a few minutes I want to address your conscious and ask some big questions. How does God view hatred? Lets cut to the chase and find out what God thinks of hatred. Jesus declared, “This is the condemnation, that the light has come into the world, and men loved darkness rather than light, because their deeds were evil. For everyone practicing evil hates the light and does not come to the light, lest his deeds should be exposed. Simply put God hates what is evil and is hated for exposing the truth. So what is evil? 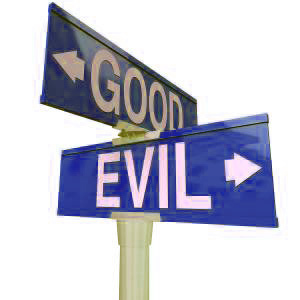 The standard God uses to define what is evil is not by any human (or fallible) standard that can change or be imperfect but can be found by looking at His perfect (moral )Law the Ten Commandments. What God’s moral Law does: It demonstrates His perfection while showing us our sin and what we’ve done wrong (evil). God is holy and perfect and He cannot have sin in his presence which means no sinful person can exist in His presence without being consumed by His judgment. Sort of like a dry leaf being consumed by fire. And as a good judge must punish a law-breaker, God must deal with as lawbreakers for our breaking His laws. God being just and righteous means He must punish sin wherever it is found. A false witness who speaks lies, And one who sows discord among brethren. Since God must punish all lawbreakers (sinners) is there any hope for any of us? Everlasting punishment in Hell is real for everyone who has broken God’s law unless there is a way of escape. God is the only one who can save mankind from His coming judgment against sin. God paid the penalty of our breaking His law through Jesus Christ. Jesus, God manifest in the flesh, took the punishment for sin by dying on a cross. While we cannot fully understand God’s sacrifice for our sin or what He went through and the love He has for us (since He’s God and we’re not) we do know he rose again after three days. Jesus’ in completing the payment for sin was raised from the grave which ultimately demonstrated His love for all who repent and believe in Him. Therefore it’s only through Jesus Christ that anyone will inherit or receive everlasting life! He was despised and forsaken of men, A man of sorrows and acquainted with grief; And like one from whom men hide their face He was despised, and we did not esteem Him. Jesus defeated death (punishment in hell), sin and judgment for all who repent and trust in Him. Do you know where you are going after you die? A couple of years ago I couldn’t wait to check my Twitter account to see what new “followers” had followed me the night before and to read any new comments from “so-and-so”. And no, I don’t mean from Donald Trump. As the comments and one-liners would rapidly appear I would scroll the feed only to be greeted by hundreds more comments I must’ve missed. The daily routine of reading comments, (many duplicated and automated) and posting comments never ended until the day I finally left Twitter. And why did I stop using Twitter? The answer is quite simple but first some background. Users of Twitter know that one purpose of the app is to gain followers and in turn follow others. And so after months of using Twitter I like many others did just that until one day it dawned on me that it’s humanly impossible to actually read a thousand plus comments from people you are “following” let alone be excepted to respond to all those folks. When I figured that out I felt as if I had been let down by Twitter. I had high hopes for creating an empire of real people followers who cared about my content but so does most everyone else. For me, the hype and appeal of what I thought Twitter might be was simply lost. I was disappointed to learn that comments I sent out to people who had followed me couldn’t possibly be seen if they already had 1 million followers they were trying to track! With all this following and being followed going on I was getting a little dizzy. And then I noticed another disappointing trend occurring on Twitter. I know this because I did it. Since people have real lives, many of those comments and links I was reading were actually being automated each day and being posted by someone else! I soon learned that much of the content on Twitter is a canned advertisement or message that had been planned out days and weeks in advance! Oh the devastation! So the question is, why would I want to read an automated message I had already read the day before and the day before that? Well I didn’t and so I would simply hide the people who posted it. And so I expect, if I was hiding people, other people where hiding people and so on. But what’s the point in that? Well I don’t see any good point really unless you think it’s great to follow and be followed by thousands and thousands of people who probably will never know you exist. However, like Facebook, I decided to jump off the Twitter bandwagon and say bye-bye to the endless (and sometimes mindless) feed of automated one liners and links that so pervasively permeate the app known as Twitter.